Map Size: approx. 36" x 20"
Rolled, high quality satin matte paper with UV resistant inks. 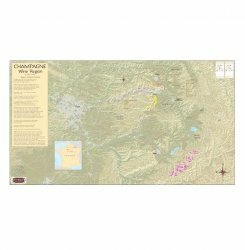 Canvas Option - (VMCHAMPAGNECAN) This map printed on canvas will be roughly $125-$155, please inquire.